When I was first diagnosed and I was in that awkward waiting period – the time when you know you have cancer but you haven’t received your pathology so you don’t know what kind of cancer – I recall telling Scott that I would feel like an impostor if I didn’t loose my hair. I saw losing my hair as a right of passage for someone with cancer. That was before I knew that much about breast cancer and chemotherapy. Not everyone with breast cancer needs chemotherapy. Not everyone with breast cancer loses their hair. However, most people with breast cancer that go through chemotherapy do lose their hair. For those that really want to preserve their hair, there has been some research done with cold caps – these are special caps worn during chemotherapy and for 4 hours afterwards in order to help preserve hair. I’ve met several people who tried them – they have had mixed results with keeping hair, and they are rather painful (imagine putting ice on your head for 6-hours – they get changed out every 30-minutes, so they don’t get warm). This certain had no appeal to me, but I do know several people who would have jumped at the opportunity to keep their hair. When it was confirmed that I was going to loose my hair, I used that as an excuse to buy a bunch of different head coverings. As someone who mostly works from home, I didn’t have much use for the various head coverings I have, but a little retail therapy made me happy. A friend sent me some scarves from Egypt – which I treasure – but don’t find that I wear, mostly because they take too much effort to put on. What I wear most frequently are the survivor “buffs“, of which I now have 5 or 6 in various colors. I used my baldness as an excuse to buy a bunch of them – cause I’ve always loved them and wanted more, I just couldn’t justify purchasing them until now. If you just looked at this blog, you’d think that I mostly went outside with my head bald. I have no shortage of pictures of me sporting a shiny head. In reality, I’m actually quite conscious when I appear without something covering my bald head. I almost always throw on a buff or some other form of head covering before leaving the apartment – even when I’m justing running out to the elevator to dispose of the trash. It isn’t me that I’m worried about. I’m worried that my baldness will make others feel uncomfortable. Lately, I’ve been fixated on my hair as it starts to grow back. I find myself examining it each day, to see if there is any noticeable change. Of course, because I examine it daily, I don’t usually notice much difference. I’m most annoyed with my eye lashes. I seem have lost a bunch of them on the right side – so I have gap in my eyelashes. There are small black dots where new lashes are starting to come through – but they are growing rather slowly. I keep hoping I’ll look in the mirror and one day, magically, they will be back. My head is now covered in a layer of peach fuzz about half a cm long. In addition, there are short dark spiky hairs. I’m not sure if the peach fuzz will fall out and be replaced by dark hair, or whether the translucent peach fuzz will turn into dark hair (such that I’ll need to shave it again so it grows in nicely). 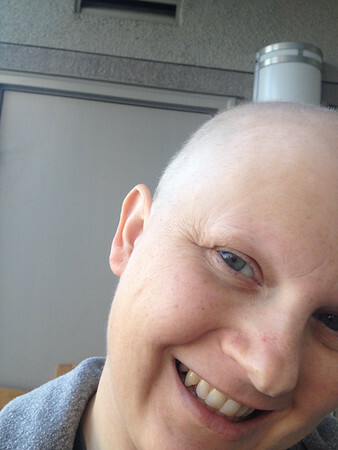 Now that the chemo is done, I can anticipate that my hair will start growing back – and maybe even filling in. It will probably be another 2-3 months before I don’t feel like I’m walking around bald. We’re looking forward to seeing you at the end of November. Following chemo our very good friend Sylva’s hair came in darker and very curly. Later, it was her normal hair. I don’t see your bald head, I just see your beautiful smile.